Emory University provides $9.1 billion in economic impact within the Atlanta region and Georgia, while supporting nearly 64,000 jobs and generating $200 million in state tax revenues, according to a new impact study released this week. The university’s role as an economic engine and community partner is outlined in “Emory University Impact Report: From Local Engagement to Global Innovation,” which provides an in-depth overview of Emory’s investment in the region’s economic health and well-being, community engagement, academic excellence, research and innovation. Sterk is a strong believer in closer ties and partnerships statewide, including the immediate campus vicinity and City of Atlanta, noting that $4.4 billion of the reported economic impact occurs within the City of Atlanta and the Druid Hills campus. Emory has 30,000 employees, making the university the largest employer in DeKalb County. 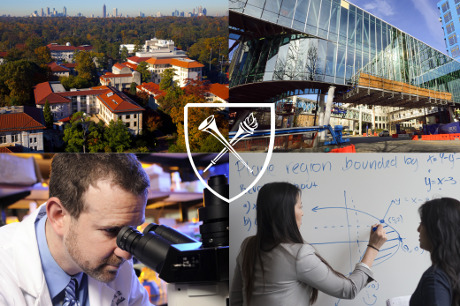 “Emory attracts the best and brightest students, faculty, researchers and health care providers, who in turn produce scholarship, scientific discoveries and entrepreneurial innovations that greatly benefit our community and society at large,” says Sterk. Emory’s overall impact from capital investments in Georgia translates to $330 million annually, with more than $685 million in direct capital investments in the past four years. As part of Emory’s last master plan (2005-15), the university invested or enabled more than $1 billion in capital projects, resulting in a significant contribution to the local economy. Emory is ranked among the top 20 national universities by US News and World Report. Emory is committed to affordability and accessibility, contributing $274.7 million to students’ financial need, in addition to the $147.6 million provided by the federal government, in the 2015-16 academic year. Emory Healthcare is the most comprehensive health care system in the state of Georgia and a leading academic health center nationally. Last year, Emory Healthcare served more than 600,000 patients. Emory’s Woodruff Health Sciences Center provided $400 million in overall community benefits, including $72 million in charity care by Emory Healthcare. Emory’s Rollins School of Public Health (RSPH) is a key reason Atlanta is known as the “Public Health Capital of the World.” RSPH is a leader in developing ways to increase access to safe drinking water, adequate sanitation and appropriate hygiene as part of a global strategy to break the cycle of poverty and disease in the world. A significant number of graduating students — approximately 40 percent — choose to stay in Georgia, while earning an additional $800 million a year as a result of the education and credentials they received from Emory. Emory attracted $575 million in research awards in FY16 in the basic sciences and humanities to advance knowledge to serve society, including improving and saving lives. Each year for the past seven years, Emory has attracted a half billion dollars or more in research awards to metro Atlanta and Georgia. Emory has done groundbreaking work in many areas including Alzheimer’s disease, autism, Ebola training and education, and Zika research. Winship Cancer Institute is Georgia’s first and only National Cancer Institute-designated comprehensive cancer center, providing access to cancer care not found elsewhere in the state. This designation places Winship in the top one percent of all cancer centers in the United States. The “Emory University Impact Report: From Local Engagement to Global Innovation,” is available here.